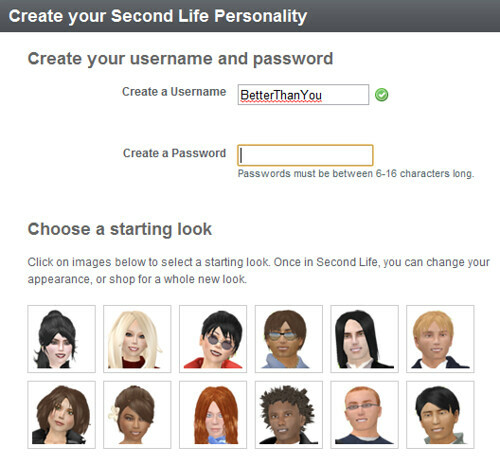 Linden Lab launched the new username registration thing today and now you don’t need to choose a last name to have an avatar in Second Life anymore. Someone grabbed Gogo and Gogolita before I could (sadface!!) but that’s okay because my friend Melanie grabbed Juicy and JuicyBomb for me!! These are the official new username avatars for Juicy brand, Juicy sim(s) and this website. YAY.YAY.YAY.YAY! When I tried to use search and typed in “Juicy” — the newly created avatar comes up first, then my region. Before, region name had priority over everything else. I would suggest that people at least register their brand name, to be more visible in search. And whoever has Gogo/Gogolita you can give it to me if you want 🙂 LOL! * Btw, I did not register BetterThanYou, that was just an example. So does that mean I have to use the new avatar to explore the world? Oh no! I can’t stand to have such a awful newbie look. It feels like I have to restart my SL. Woot! Got Sedge. Quite pleased. Does this mean we’ll see lastnameless avatars walking around in SL? Technically the way it works is rather than just eliminating last names all together, the default last name is ‘Resident’. So a full name would be like ‘Juicy Resident’. I think you’re on an older viewer, because in SL 2.3+, it just shows a single name. Try searching for “Juicy” — I am not talking about display names, but actual login. I don’t have to type in Juicy Resident. Yea, I’m using Phoenix for building, photos, and combat. But yea, the last name technically is Resident, just that it doesn’t show in your username bubble or login. Probably was a work-around on the registration page that it needed a last name or else the form would fail, rather than deleting the code they created a default. Coding and all that. i did it with anahata and typed in ‘anahata’ and it showed up as such, but when i looked at my profile it said ‘anahata resident’ so not sure if i run around with that over my head probably hopefully not lol. i’m sure the resident is just a distinction that you are a person. The last name “Resident” appears only if you are using the old viewer, or using a TPV based on the old viewer. I grabbed Eurydice, but I think it simply created it for an alt *bangs head* so if anyone has a solution as to how to transfer the name to my mai avi I’d love to know. It’s actually kind of fun registering new names. Now I have a new person to dress up! Layne, you are the weirdo who has the Layne Jewell account. 😛 No one can register that name cuz it’s taken by you. Tried to grab mine (rockberry), **sigh*….somebody already got it. and its not showing in search, but it says its already taken. I grabbed one up too. I just made it xtcDesigner, instead of xtcDesigns lol. Great idea though! this reminds me of people grabbing up .com names then trying to sell them… well cept for the selling part, which i hope it doesn’t come to that. Yes but can ANYONE tell me how to get to the old username signup page for SL? cuz i still use the old original viewer and I would like to still be able to make old accounts with TWO names not one cuz i dont wanna upgrade to the new viewer. If anyone knows how to get there please e mail me with the link. or you can IM me in world too. my username is Golduck Silverblade.